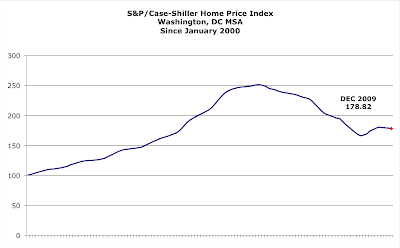 The S&P/Case-Shiller Home Price Indices report for June 2010 was released this week. 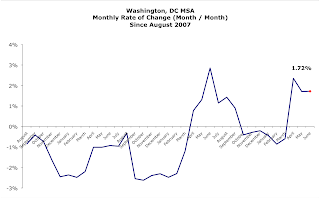 The report shows "show that the U.S. National Home Price Index rose 4.4% in the second quarter of 2010, after having fallen 2.8% in the first quarter. 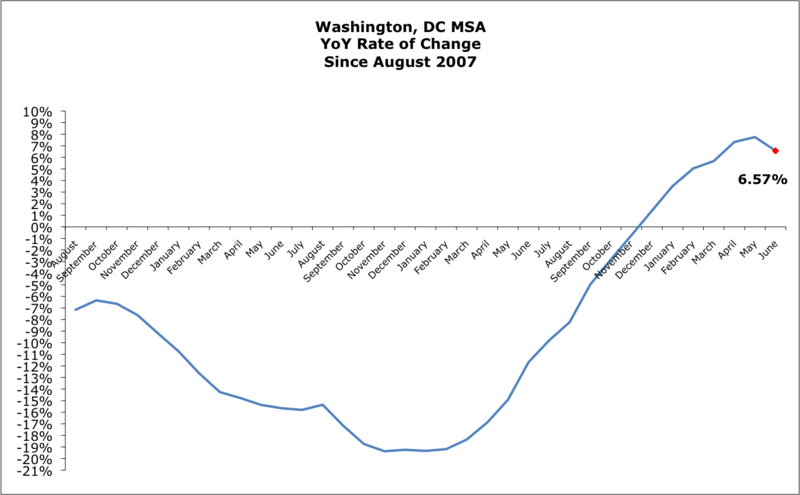 Nationally, home prices are 3.6% above their year-earlier levels. In June, 17 of the 20 MSAs covered by S&P/Case-Shiller Home Price Indices and both monthly composites were up; and the two composites and 15 MSAs showed year-over-year gains. Housing prices have rebounded from crisis lows, but other recent housing indicators point to more ominous signals as tax incentives have ended and foreclosures continue." 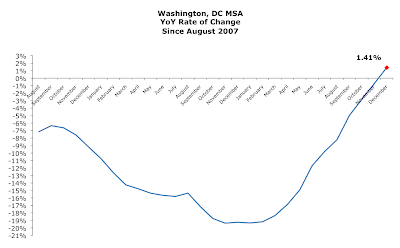 YoY, DC prices rose 6.57%. However, it's interesting to note that since April, the YoY and Month/Month rate of increase, while positive, is declining to flat. MRIS released its data for July about two weeks ago. I think the report's a little deceptive. Yes, average prices are up. However, unit sales and dollar are down. It turns out that having 50 units sell for more than $1 million can sure juice the month's average sales price. Oh, and has anyone mentioned that inventory has exploded? YoY, aggregate dollar volume fell 7.02% and the number of units sold cratered 18.36% [I learned a new verb!]. However, average sales price rose an impressive 13.9%. Condo dollar volume fell off a cliff, down 17.98%. Home dollar volume was comatose, down 0.4%. Condo sales volume were pushed off the cliff, down 29.45%. Home sales volume was down 8.26%. Average prices exhibited a split personality. Condo prices increased 16.26%, while home prices were up 8.57%. At July's sales rate there's a 7.02 months supply of condos and 5.17 months supply for houses. More ominously, compared to June the condo inventory grew 23.3% while that of homes blossomed 35.73%. Well, I'm definitely back in the saddle again. 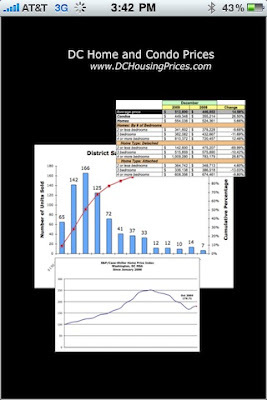 I downloaded and have begun processing the District's sales data for June 2010. There's still much to do, but here are some preliminary data. 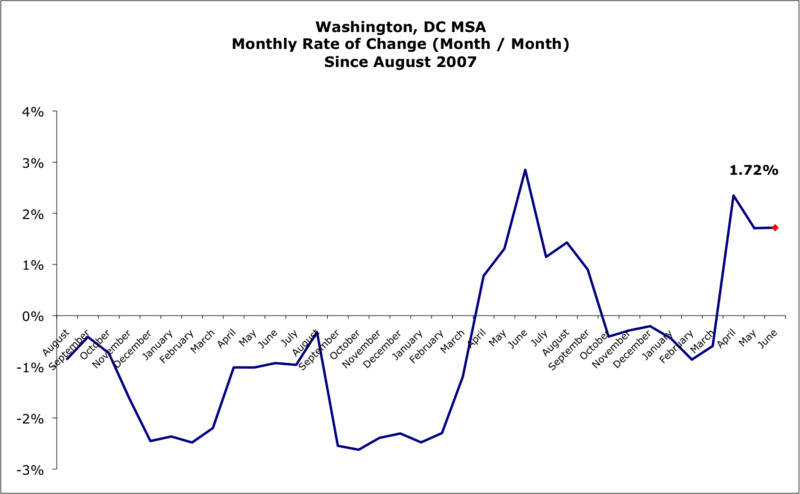 Average price was up 13.9%, median increased 11.4%. Unit sales volume [aggregate] was down 18.36%. Home unit sales fell 8.52%; 50 homes sold for more than $1MM! Condo unit sales were down a whopping 29.4% YoY although prices rose 16.26%; 9 sold for more than $1MM. Sales prices were 94.46% of list. There is a 7.02 month supply of condos and 5.17 month supply of homes listed for sale. The condo inventory doubled since June [as measured by units listed divided by the number sold in the month]. I think that since so many properties sold for more than $1MM [59 out of 529], the average price metric is almost meaningless as serving as an indicator of the market's future performance. Sorry for the long absence from this blog. I've been busy with a new project and it's been a huge time sink for me. 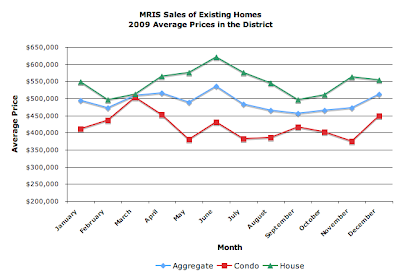 MRIS released its data for March signed sales contracts for existing home and condos in the District many days ago. Need I say it? Volume up, prices down. YoY, aggregate dollar volume increased 24.94% and the number of units sold increased 35.09%. However, average sales price fell 7.51%. Condo dollar volume was slightly higher, up 4.83%. Home dollar volume, by comparison, was as high as a Wall Street liar's - er, "investment" banker's - bonus, up 41.48%. Condo sales volume increased 18.68%. Home sales volume popped upward like a CDS on a AAA-rated synthetic CDO, up 48.85%. Condo prices dropped like Lehman Brothers, down 11.67%, while home prices fell 4.95%. Can you tell I just read Michael Lewis' "The Big Short"? Sophisticated investors, indeed. At March's sales rate, there's a 7.41 months supply of condos and 4.67 months supply for houses. Which means that the market's soft for condos and hot for houses. I can attest to the latter. In my neighborhood, every house that has hit the market is under contract within a week. Home unit sales up 48.84%; 30 homes sold for more than $1MM. Condo unit sales are up 18.68% YoY, but prices fell 11.67% despite 12 condos selling for more than $1MM. Sales prices were 92.67% of list, as in February [how likely is that?]. 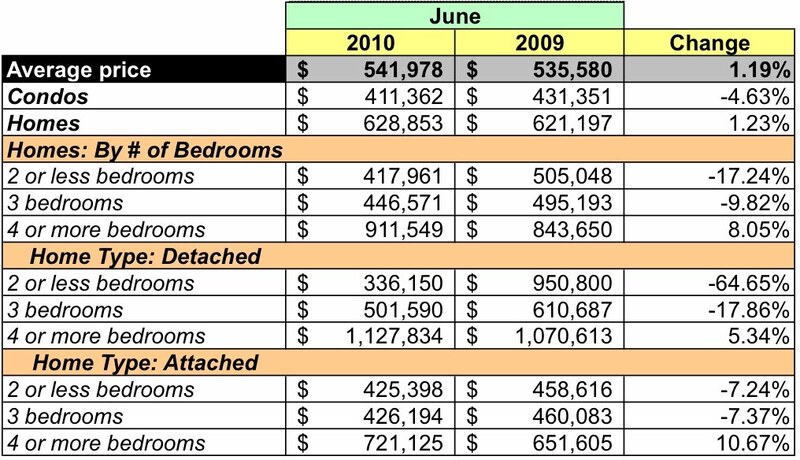 There is a 7.41 month supply of condos and 4.67 month supply of homes listed for sale. The S&P/Case-Shiller Home Price Indices report for January 2009 was released this week. The report shows "that the annual rates of decline of the 10-City and 20-City Composites improved in January compared to December 2009. In fact, the 10-City Composite is unchanged versus where it was a year ago, and the 20-City Composite is down only 0.7% versus January 2009. Annual rates for the two Composites have not been this close to a positive print since January 2007, three years ago." 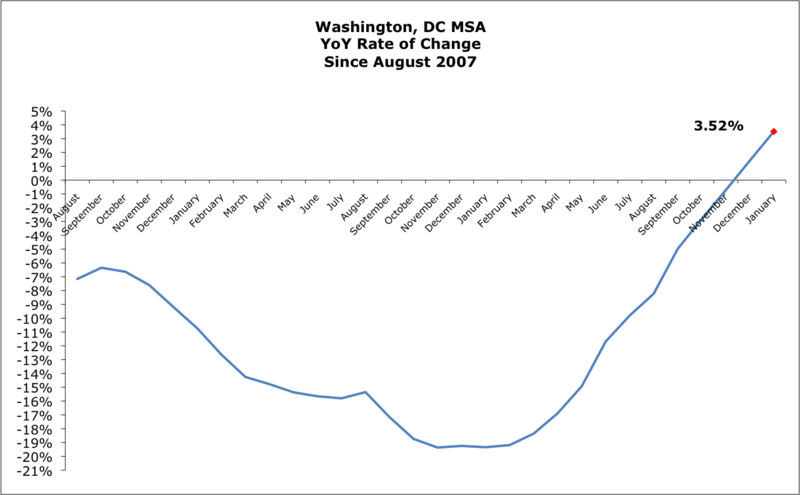 For the DC area, it looks like prices have stalled. Although up 3.52% YoY in January for the second consecutive month, after monthly declines since September 2006, the monthly price increases have stopped and actually declined 0.45% in January. 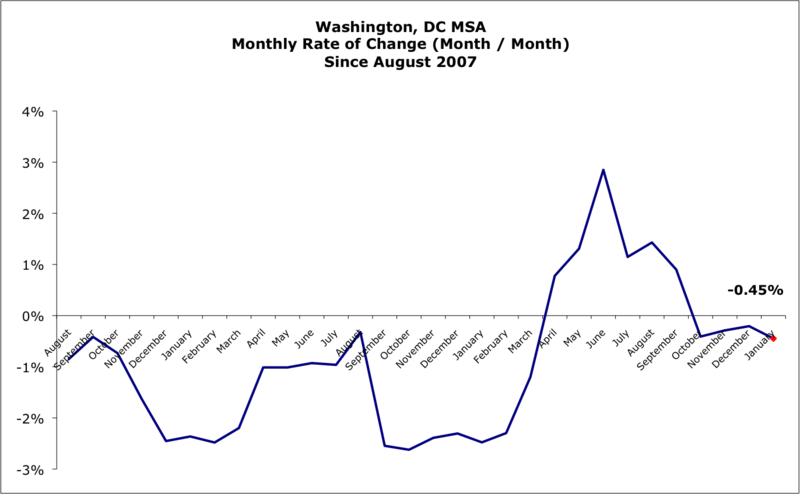 MRIS released its data for February signed sales contracts for existing home and condos in the District a few days ago. We're back to the same old routine: volume up, prices down. YoY, aggregate dollar volume increased 28.21% and the number of units sold increased 34.63%, but average sales price fell 4.77%. Condo dollar volume increased a healthy 23.38%. Home dollar volume was 30.92% higher. Condo sales volume was up 46%. Home sales volume popped up 27.39%. 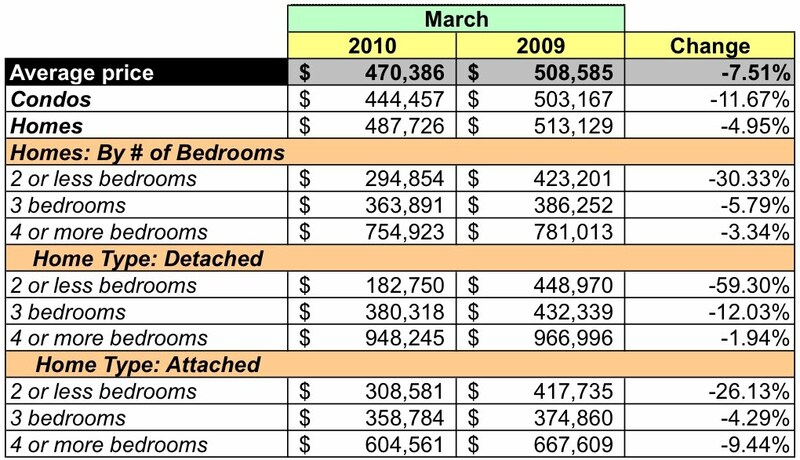 In other words, home sales have returned to February 2008 levels while condo sales are about half that of the same month. Condo prices dropped 15.49%, while home prices were up 2.77%. At February's sales rate, there's a 9.25 months supply of condos and 7.05 months supply for houses. While that's a slight uptick for condos [+0.28%] and a tiny decline for homes [-0.6%] when compared to January, that's 60% and 42% higher than December's inventory, which isn't encouraging. Home unit sales up 27.39%; 10.5% of homes sold for more than $1MM. Condo unit sales up a whopping 46% YoY; only 1 condo sold for more than $1MM. Sales prices were 92.67% of list. At February's sales pace, there is a 9.18 month supply of condos and 7.05 month supply of homes listed for sale; both metrics indicating weakening demand. Jeez, has it really been almost two months since I last posted? My apologies, I've had a lot going on. 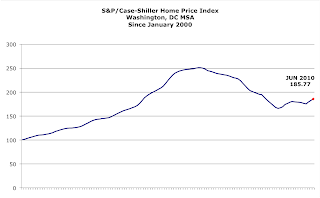 The S&P/Case-Shiller Home Price Indices report for December 2009 was released last week. The report shows "show that the U.S. National Home Price Index fell in the fourth quarter of 2009 but has improved in its annual rate of return, as compared to what was reported in the third quarter ." 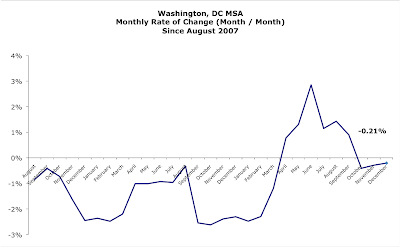 For the DC area, sales prices declined 0.21% in December compared to November, but are up 1.41% YoY, the first positive YoY metric since September 2006! I'm pleased to announce that this blog is now an iPhone app! For those of you who don't have an iPhone, either buy one - this blog more than justifies the price! - or keep on walking. The app provides access to my blog postings and to tweets I send using my Twitter account, dchousingprices. The app, "DC Prices", can be downloaded from the App store on your iPhone or from iTunes [link to app on iTunes]. And it's free! For those who may want to create their own iPhone app, you may be interested to know I used a local company to create mine. Appmakr, officed in SE DC, has implemented a transformative process for app development that significantly lowers the barrier to entry into the iPhone app market. They've lowered the cost to create an app, taking it from the thousands of dollars to the hundreds of dollars [within certain parameters, of course]. Unfortunately, as I've recently discovered, all their good work in making it easier for folks to build iPhone apps can easily be throttled by the vagaries of Apple's gatekeepers to the iPhone App Store. 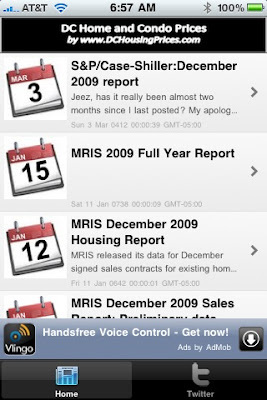 Below are images of the splash screen and the blog feed taken from my iPhone. 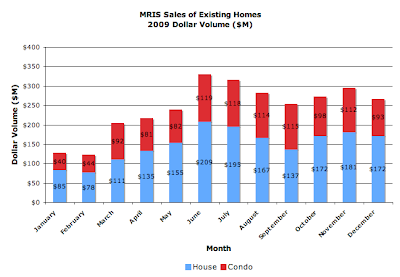 MRIS has not yet released its full year summary report for signed sales contracts for existing home and condos in the District during 2009. However, I have all the data so there's nothing stopping me! 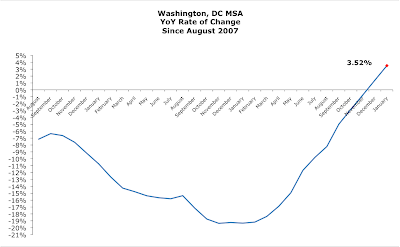 In many ways, 2009 was a good year for residential real estate sales in the District. Generally, more units sold and the total value of homes sold increased in 2009, but prices fell. Key points are in the table below. More homes and condos were sold. 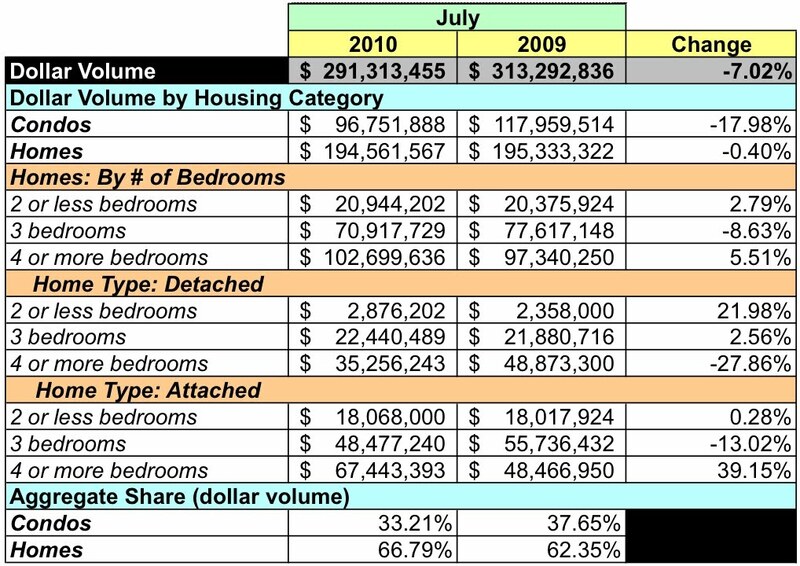 Sales volume grew 10.23% for condos and 22,63% for homes. 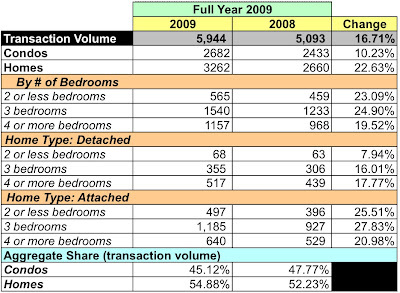 All categories of homes experienced respectable sales growth in 2009. Condo dollar volume increased 10.62%, but home dollar volume was essentially flat, up a mere 1.78%. 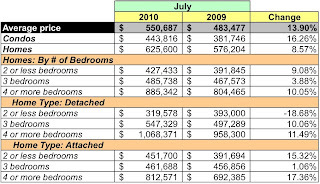 Although more units sold and the dollar volume grew, average prices were unchanged or negative. 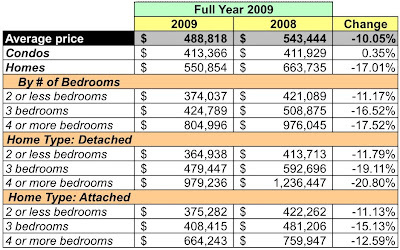 Condo prices tread water in 2009, up 0.35%. Home prices took a hit, down 17.01%. 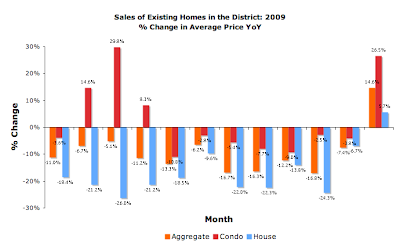 Every home category saw double digit price declines. 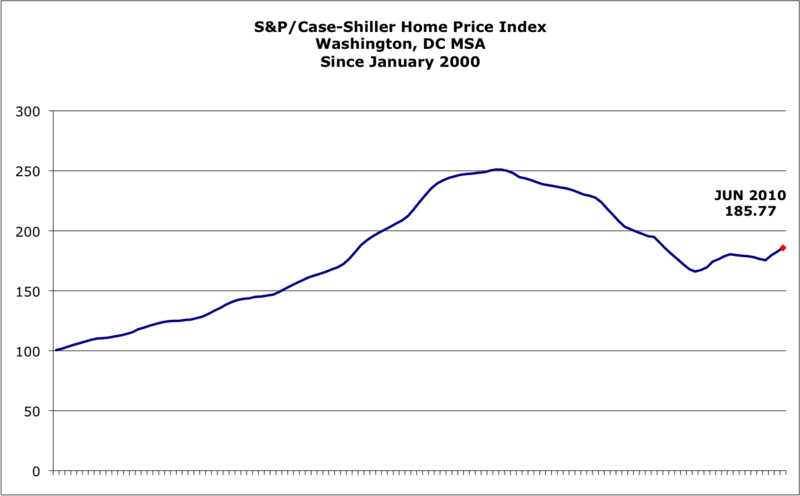 It's important to note that December 2009's prices were higher when compared to January 2009. In other words, the average price for a condo in December was 9.18% higher than January's average price. 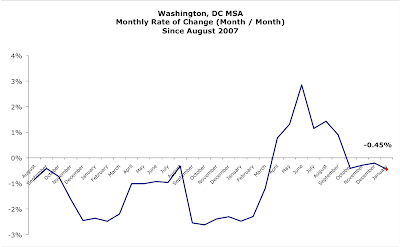 Similarly, the December home price was 1.03% higher and, overall, the average price in the District grew 3.36% January to December. Looking at the graphs below, you'll observe that the number of condos and homes sold peaked in July - each subsequent month had lower sales volume except for spikes in October (homes) and November (condos). 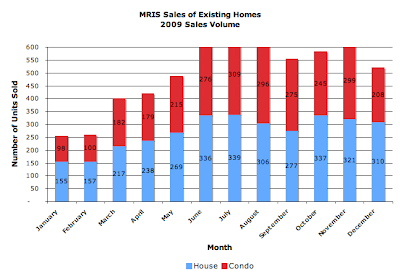 MRIS released its data for December signed sales contracts for existing home and condos in the District today. Unlike the past few months, sales and dollar volume and prices are higher than the same period last year. While the YoY numbers look good, they aren't so spectacular when viewed within the context of the all sales in 2009 [more in my next post]. YoY, December was a good month across the board. Aggregate dollar volume surged 41.65%, the number of units sold increased 23.63%, and average sales price was up 14.58%. Condo dollar volume increased a respectable 37.04%. Home dollar volume was 44.29% higher. Condo sales volume was up 8.33%; not robust, but decent. Home sales volume popped tall, up 36.56%. For the first time in months, prices did not fall. Average prices rose 14.58%. Condo prices were up 26.5%, while home prices were similarly higher, up 5.66%. At December's sales rate, there's a 5.76 months supply of condos and 4.96 months supply for houses. Both metrics are indicative of a tight housing supply. However, the condo supply grew 29.69% from November while that for homes fell 3.65%. I've compiled full year sales information using MRIS data and will report that in my next post.